• Iguanodon (two metre long bronze resin dinosaur). This sculpture was commissioned jointly by The Cuckfield Society, Cuckfield Parish Council and Mid Sussex District Council for a new play area in Cuckfield, West Sussex. The sculpture celebrates the discovery in Cuckfield of the first Iguanodon teeth by Mary and Gideon MantelI. This was a crucial find that sparked the discovery of the Iguanodon but also led to the realisation that large land-dwelling lizards had once roamed the earth. In 1842, they were named as dinosaurs ('terrible lizards'). • Hauling Man (life-size bronze). Commissioned by Kier for the new Tesco store in Hailsham to celebrate the history of rope making in the area. • Iguanodon (3 metres x 2 metres bronze & brick) commissioned by Miller Construction in connection with Horsham District Council, as part of the redevelopment of Southwater, West Sussex. The sculpture celebrates the history of brick making in the area and the local discovery of Iguanodon bones. • The Saint Leonard's Forest Dragon (human size bronze), centre piece for the Children’s Millennium Maze, Horsham Park, West Sussex. Hannah has always loved sculpture and was keen to study at a school where she could learn the traditional skills of modelling and casting. 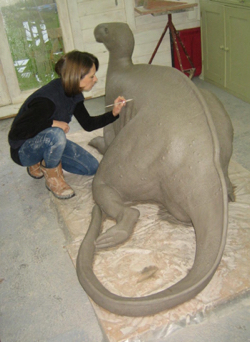 After a foundation course in conservation and restoration Hannah completed a three year course at the City & Guilds of London Art School, where they valued working from a model and taught the roots of sculpture. After graduating in July 1998, Hannah went on to win a succession of awards for her work, including second prize in the Sefton Open Exhibition 1998; the Major Award from the Manchester Academy of Fine Arts for her sculpture Consider in 1999; and the Alec Tiranti Prize for Young Portrait Sculptors in 2000. The recognition she received after the Alec Tiranti Prize led her to be interviewed by The Times for the Great British Hopes column. Read an interview with Hannah in AAH Magazine.